L'ATHENE offers a complete natural skincare regimen... to help calm and not further irritate rosacea-like skin. Redness of the skin, often known as rosacea, can be on the nose, cheeks, chin or forehead. This uncomfortable, chronic condition should be diagnosed by a doctor. Rosacea cannot be cured, but treatment can help you control the symptoms. There are a variety of medical topical treatments that are available from the dermatologist. With rosacea, good chemical-free skincare daily is a high priority. Redness can be accompanied with extremely sensitive skin, blushing, flushing, a burning sensation, stinging, swelling, pustules, and broken veins. L'ATHENE products are 99+% chemical-free and are very helpful for patients with rosacea-like skin. These pure natural products are formulated with the highest-quality nutrients that are nourishing, mild and non-irritating. The SR-3 Skin Rejuvenation Starter Kit contains a mild non-detergent cleanser, an antioxidant serum and a quick-absorbing moisturizer to restore, rejuvenate and rebalance skin. To help with the excess oil and bumps on the skin, use CLARIFIQUE Purifying Clay Mask for 2-3 minutes every other day to absorb oil and help reduce breakouts. As the skin tolerates the mask, you may leave the mask on the skin longer - up to 20 minutes 2-3 times a week. NUTRIAGE Total Eye Repair Creme may be helpful to apply twice daily to eye area to help reduce puffiness and irritation. Rosacea-like skin is very sensitive to chemicals. Almost all cleansers are made with detergents which can be very harsh and irritating to skin. Soaps are made with detergents too. For gentle yet effective facial cleansing, use PRIMESSE Essential Facial Cleanser, which is a mild, non-detergent facial cleanser that will not strip the skin of its essential moisture balance or further irritate the skin. It keeps the skin balanced and healthier. Make sure to use a natural non-detergent shampoo too on your hair to avoid exposure on your face to potentially irritating ingredients. Almost all skincare, including medical skincare brands, contain alcohols, petroleum-derivatives, detergents, and many other skin irritating ingredients, that can cause further redness, inflammation or discomfort. This also includes many products that claim they are good for sensitive skin. Become a label reader. Read more about the ingredients in L'ATHENE products. Another way to avoid worsening of rosacea symptoms is to protect your skin from excessive sun exposure. 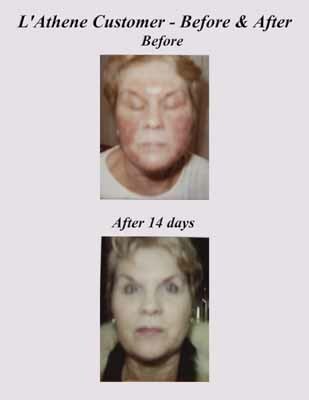 Daily use of sun blocks is important to keeping rosacea-like symptoms to a minimum. Certain stimulants can make rosacea 'flare up'. The most common triggers are: sunlight, spicy foods, caffeine and alcohol. Additional triggers can be: hot showers, exercise, stress, anxiety, weather (extremes in temperature and wind), some foods, hot beverages, some medications and skincare products. Avoid skincare products that contain alcohols, irritating chemicals or ingredients that cause redness or stinging. Experts do not agree on what causes rosacea, so the cause is listed as 'unknown'. It tends to affect fair skinned people more, affects both men and women of all ages, and it usually runs in families. Tiny blood vessels dilate and cause the redness. Some experts believe that rosacea is caused from trapped oil. This oil causes the capillaries to rise and become more visible and more easily irritated. It is sometimes referred to as 'adult acne' because the outbreaks can look like acne.